WTMD is thrilled to bring the award-winning vocal showcase EMBODY back for a third installment Jan. 10! 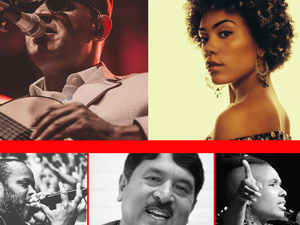 Curated by the Baltimore vocal artist Shodekeh, this year’s EMBODY has the strongest lineup yet: Grammy nominated singer-songwriter Raul Midon, Madison McFerrin (daughter of the legendary Bobby McFerrin), Nepalese folk singer Prem Raja Mahat — the “Bob Dylan of the Himalayas” — as well as Peabody Conservatory-trained opera singer Shurmi Dhar, Baltimore vocal artist Shodekeh and jazz singer Akua Allrich. EMBODY is like no other show — the human voice is the only instrument allowed. No guitars, no drums, no effects. Just the human voice. The past two EMBODYs at WTMD have sold out, so be sure to get your tickets in advance! Shodekeh first teamed up with WTMD in 2016 to bring the Baltimore electronic artist and composer Dan Deacon to EMBODY for Dan’s first vocal-only set since he was in college. It was epic. But even more mind-bending was the multi-cultural 2017 EMBODY, featuring Alash, one of the greatest Tuvan throat singing groups in the world. The ensemble finale, featuring Tuvan throat singing, beatboxing and more was one of the craziest scenes at any EMBODY to date. EMBODY will change the way you think of the human voice and what it can do.